Designing with stone and rock to compliment and support natural landscaping elements. 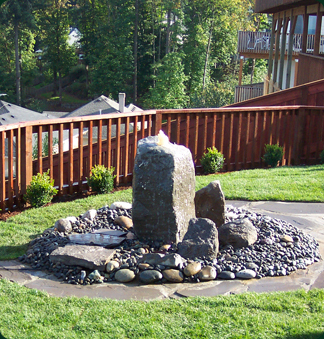 A corner stone of any landscape, nothing says the Northwest more than natural stone. An accent moss boulder in just the right location or a bluestone slate patio is all in our background. Stone retaining walls, modular concrete or brick pavers for walks or pathways can all be accomplished with Landscape Solutions. We look forward to serving you! "The stone work was done in a timely fashion and we love the new look. Since the work was complete, we have received several compliments from our neighbors on the terrific improvements."